Creating an SEO Friendly URL is very important for any site and it is the most important part of on-Page SEO. Plus it’s a Google Ranking Factor. If you optimize your URL well, like the page title, it helps the search engine understand what your content is about. Today in this article, I will tell you how to optimize URL for SEO. URL optimizations are a very easy task. It makes your content more SEO friendly and helps to get a better rank in SERPs. It is very important to drop Keyword in the URL. Use your main keyword in the URL. Also, try to put it at the beginning of the URL. Keep one thing in mind, do not repeat your keyword in URL, it will be called keyword stuffing. Google does not like it at all. According to the search engine optimization and user readability, this is very important. Use Hyphen (-) for word spacing in your URL. Never use underscore (_). Because words separated from underscore are considered a single word. Keep your URL as short as possible. Also, it should be descriptive. Short URL is easy to read and write. If you use similar words repeatedly in the URL, then this will be considered keyword stuffing and it can cause your ranking drop. You can use 4 to 5 words for your URL. If you add more than this, your URL will not appear entirely in search results. A well-optimized URL should not contain unnecessary folders. So use the required folder and category in your URL. However, Instead of showing the folder or category in the URL, I would recommend showing only the post URL. Never Use Capital Letters in URLs. And I hope you will not do this. Even then, I thought, let me mention it here. If you use uppercase letters in your URL, this can cause redirect or error on certain servers. Use Safe characters in your URL instead of unsafe characters. Avoid using unsafe characters. The reason is that they can create issues for browsers, which makes usability issues. Here is a quick reference chart from Perishable Press, that explains which characters are “safe” and which characters should be encoded in URLs. Use SEO-Friendly URL Structure for your blog post so that search engines can easily understand your topic. If you are a WordPress user, then you need to pay attention to this. But do not worry, you can easily change it into the SEO friendly. 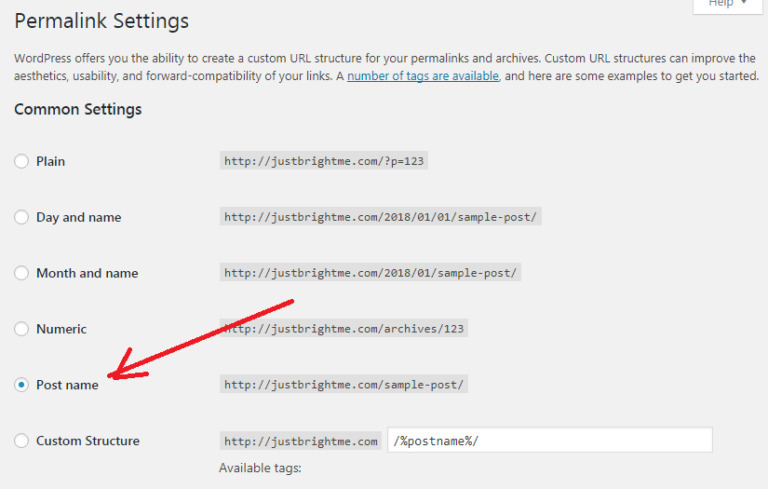 Just click on the Settings >> Permalinks option and select “Post name”. Use Keyword in your URL. Do not keyword stuffing in your URL. Try putting the keyword at the beginning of your URL. Use Dash (-) for Separating Words. Keep the URL short and readable. Limit the number of folders / categories in the URL. Always use the lowercase letter in your URL.